Convert support emails and chat transcripts into Freshdesk tickets. 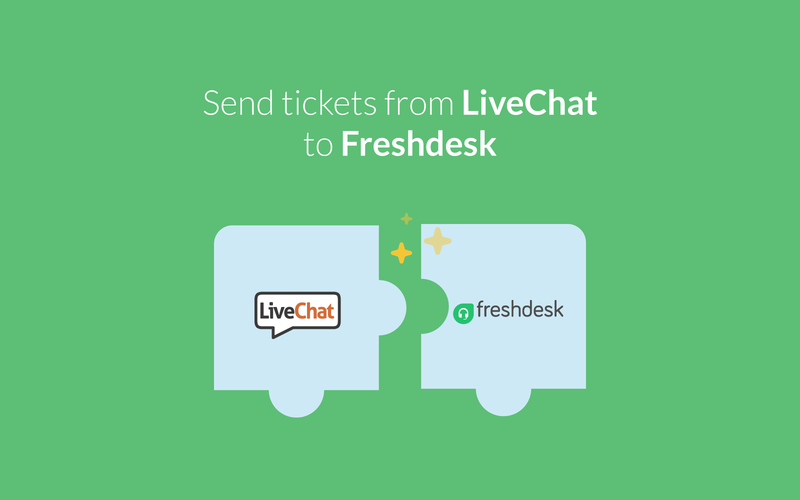 Connect LiveChat and Freshdesk to easily forward support emails and log chat transcripts as tickets to Freshdesk. Keep all important data in one place and streamline the functioning of your customer service department. Freshdesk is a full-fledged cloud-based customer support solution. Built with an emphasis on usability. The solution is entirely customizable and provides all the tools a company needs to wow its customer. The software comes with multichannel capability, integrated gamification mechanics to supercharge agent productivity, smart automation and a lot more. With our integration, you can easily push all chat transcripts and tickets straight into Freshdesk. And the best part is that we'll take care of it for you automatically. There's no need for any advanced configuration or even installing any plugins – adding your Freshdesk email address will do it! Save your time and use it for something that really matters. With LiveChat comes tons of customer data — the pre-chat survey collects contact details, chat transcripts give powerful sales insights, and post-chat survey can be used to gather feedback. Using LiveChat and Freshdesk makes it easy to manage all of your customer requests and follow-up activities from one place. With LiveChat integration for Freshdesk, it’s easy to monitor customer engagements, conduct quality control and both support and supervise agents. Start using LiveChat with Freshdesk now!